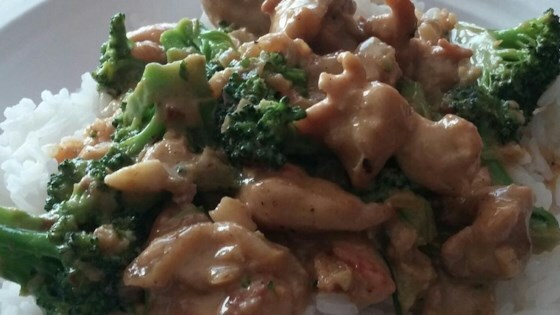 "This paleo-style stir fry uses coconut milk and curry powder. Try it with shrimp!" Mix coconut milk, ginger, lime juice, fish sauce, oyster sauce, garlic, chile-garlic sauce, and sugar together in a small bowl. Heat avocado oil in a large skillet or wok over medium-high heat. Stir-fry chicken in the hot oil until no longer pink, 8 to 10 minutes. Remove from wok and keep warm. Leave remaining avocado oil in skillet. Stir onion and curry powder into hot oil in skillet; cook 2 minutes. Stir in broccoli; stir-fry 3 minutes. Add coconut milk mixture and bring to a boil. Reduce heat to medium and simmer sauce and vegetables for 3 minutes. Return chicken to skillet; cover and cook until chicken has heated through and vegetables are tender, about 3 minutes. Use olive oil in place of avocado oil; use sugar substitute if you don't eat sugar. This was really good. I did not have broccoli and used asparagus instead. It was terrific. Will make again!!!! I made it using shrimp and it turned out delicious. Added some carrots and yellow peppers which added a nice flavor. Served over a bed of rice. My family devoured it! Not a morsel was left!